In today’s post-modern world, where just about anybody with access to social media can proffer an opinion, how does a believer become rightly-guided? Where does a Muslim’s moral compass come from? 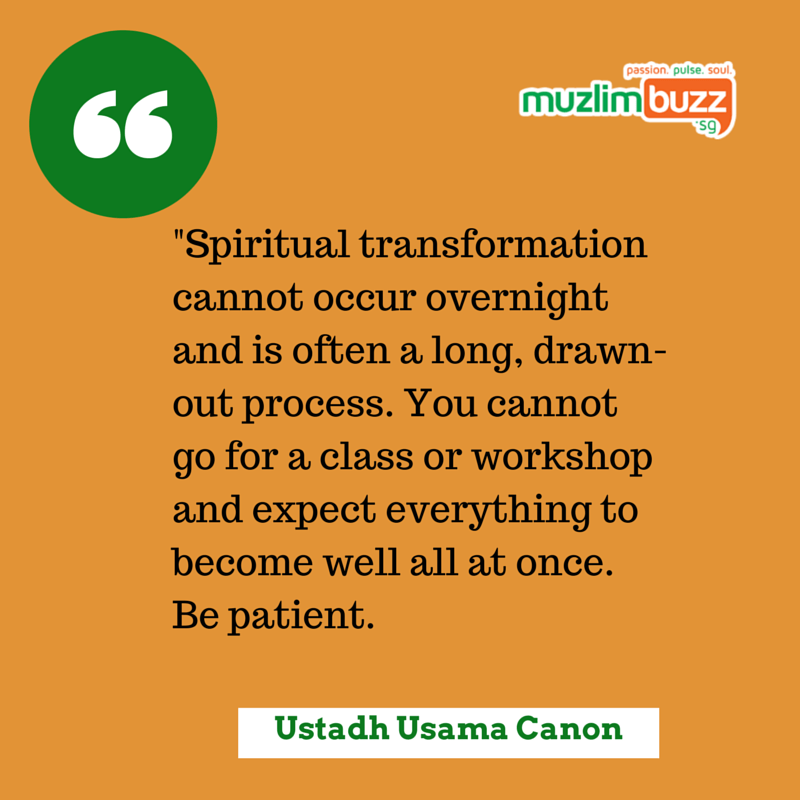 About 100 people showed up at 152 Still Road, the former premises of the Al-Khairiah Islamic School, for a workshop by Ustadh Usama Canon, a popular American preacher of Islam to find some answers to these pertinent questions. The workshop, held on Saturday, the 6th of December 2014, was part of his 3-day Clarity and Balance Tour, organised by local Islamic education services provider SimpyIslam.sg. On a wet blustery morning I made my way to the workshop not knowing what to expect, as I had never really had the chance to sit through a lecture or workshop by Ustadh Usama before. I have to admit from the onset that I was pleasantly surprised by the breadth of his knowledge, which could only be described as eclectic. In his tireless discourse, he broached not just the traditional sciences of Islam such as Qur’anic exegesis, Sufism and Arabic grammar, but also interesting philosophical and literary concepts. Nevertheless, as someone who grew up in a region blessed with a brand of Islam that is distinctly Sunni-Sufi-Shafi’i-Ash’ari, I must admit my tendency to distrust foreign speakers of the faith, who may not understand the local customs and context as intimately as our Singaporean asatizahs. However, Ustadh Usama put my mind completely at ease when he responded to a question from a sister on the actualisation of the Public Minimum versus Private Maximum concept in Singapore. (Ustadh Usama elaborated upon this concept at length, more on it later in this article). He cautioned, “Be careful of adopting approaches to Islam from other places that are foreign to the Singaporean context.” He further went on to say that it would be very dangerous for the Singaporean Muslim community to allow outsiders to come in and tell them that what they had been practising for generations was not true Islam. “Singapore, believe it or not, is actually unique. You have a lot going on here which is one of the reasons you should be careful of adopting the approach to Islam that other places have taken. There is actually, alhamdulillah, reasonable stability here historically and reasonable cohesion that other places don’t have,” he said. As to the question of what makes a believer rightly-guided, Ustadh Usama Canon was quick to shoot down any notions that he would offer his own take on what makes a Muslim rightly-guided. He instead chose to refer to Surah Al-Baqarah from the Qur’an and listed out the six attributes of a Muslim with taqwa: He or she believes in the Unseen, establishes prayer, spends from that which was given, believes in what was revealed (i.e. the Qur’an and Sunnah), believes in what was revealed before (i.e. The Old Testament, Psalms) and is certain of the Afterlife. In elaborating on these six attributes, he made some very profound statements, which I feel are worth reproducing here. On believing in the Unseen, he mentioned how we live in an age where faith itself is questioned, based of scientific measure and secular atheists who want to frame things within the context of empirical proof. Muslims sometimes fall into this same error, he went on to say, measuring their faith upon what can be scientifically proven. “The very nature of faith is that you have conviction about that which cannot be measured in the sensory realm,” he pointed out. As Imam Ali proclaimed, Ustadh shared, even if the veil were to be removed, I would not increase in certainty anything. As he spoke I realised he was blessed with a gift that allowed him to blend his traditional grounding in the faith, borne from years spent as a student in North Africa and the Middle East, with his modern, frank approach. When he speaks, he transitions effortlessly from English to Arabic and back to English. On discussing the second attribute, the establishing of prayer, Ustadh Usama candidly remarked that he could not offer “anything new”, a not-so-sly dig at ‘modern’ Muslims who may be reluctant to see the miracles provided by this central pillar of Islam. “If it ain’t broke, don’t fix it,” he sloganeered. If you are already praying on time, are you praying the supererogatory prayers, he asked. Are you praying the prayer with all of the requisite etiquettes? Are you present in your prayer? Difficult questions, from a man who was proving very easy to listen to. On spending out of that which was provided, the story of Zainab, the wife of Abdullah ibn Masud, was mentioned. Because of the fact that neither her nor her husband possessed any wealth she had asked the Prophet, peace and blessings be upon him, if spending money on her family was considered charity, and he replied that those who did would receive two rewards: that of charity and of expenditure towards one’s family. There was no room for prosperity theology here, which I personally found refreshing, having heard far too many local preachers extol the rich Muslim ideal; donating much of his wealth to get closer to God, seemingly unaffected spiritually by such material excesses. If you had only enough to feed your family, you would by doubly rewarded, Ustadh Usama reminded us. Understanding these earlier revealed texts would also allow us to increase our certainty of Islam’s divinity. This is because of the many parallels between these texts and the Qur’an, Ustadh Usama stresses. For instance, in the Old Testament, it is mentioned in Deuteronomy (Chapter 18, Verse 18), how God will raise a Prophet from amongst the Israelites. The Public Minimum is thus the least you have to do to be considered a Muslim. On the other hand, the Private Maximum is the most that a person does privately. A person might pray, read a juz of the Qur’an, volunteer at the masjid and wear the hijab, but her Private Maximum would very likely differ from another person’s Private Maximum. For some people, they would never think of missing praying in congregation while others may be content with the fact that they pray at all. “When we export our Private Maximum to the public, it becomes all-or-nothing. I will measure you based on my own Private Maximum and through micro-aggression, make you feel like you aren’t part of the community,” he lamented. This is what drives youths and many converts away from Islam, this all-or-nothing approach. Spoken truly like a man with much experience in the realm of da’wah. So what should be the accepted Public Minimum to be considered Muslim? According to him, it should comprise two things: the shahadah and that which has been unanimously agreed upon by the ummah, such as the existence of Angels, Heaven, Hell and that the Prophet Muhammad is the last prophet. Nevertheless, this was where he made his comment on how the Public Minimum has to take into account the context of a country, and how it would be dangerous to adopt an approach to Islam foreign to what had already been practised here in this region for centuries. “In a given country, there might already be an agreed-upon Public Minimum. So why is it that we need to deconstruct and reconstruct it?” I didn’t ask at the time, but I suspect he was implying for Muslims here to keep to the Sunni-Sufi-Shafi’i-Ash’ari framework, similar to what his own teacher Shaykh Hamza Yusuf had stressed several months ago in a talk at PWTC, Kuala Lumpur. Once the Public Minimum and Private Maximum has been established, people within the circle have to check themselves not to “otherise” someone different from them. This would go a long way in reducing all-round aggression. However, Ustadh Usama cautioned that the concept was not to be used to suggest an ‘anything-goes’ approach. Be discerning of those around you, but reserve ultimate judgement for Allah, he advised. Using this verse, he exhorted us to listen to our hearts when in doubt, or what he called our personal GPS (God Positioning System). “You don’t have to be a scholar to know beheading innocent people isn’t right. You can bring me a thousand textural proofs, no. It just doesn’t feel right.” But what of questions related to theology or the legal aspects of Islam? For such questions, you have to ask a scholar, he told us. During the workshop Ustadh Usama also shared with us an article that had been making the rounds on the Internet fairly recently. Entitled “10 Spiritually Transmitted Diseases” and written by Mariana Caplan, it basically covers everything, albeit briefly, a spiritual aspirant needs to know on the pitfalls of the spiritual path. I’d write more about it here but I think it’s best if readers were to go through the article themselves. I will however share here three noteworthy things Ustadh Usama said with regards to said article. First, he said that spiritual transformation cannot occur overnight and is often a long, drawn-out process. You cannot go for a class or workshop and expect everything to become well all at once. Be patient. Secondly, he said that whatever you do, do it with the intention of pleasing Allah. Do not do it to seek the pleasure of people, because the pleasure of people is an unattainable end. Worse, do not perform a type of worship because of the spiritual experience, because this can be considered shirk. Worship Allah for Allah. Third, do not be proud no matter how much you know or practise. Sit with people who are much better than you. Remember where you came from and how you were once not as advanced as you may be now. It’s a shame that some people are harsh on others who are less advanced in terms of the faith when they were once like that, Ustadh Usama said, again bringing up the Public Minimum concept he had gone through earlier. To avoid these various pitfalls, we were told to pray that Allah guides us to someone who will then guide us to Him. “Oh Allah! Guide Me to someone who will guide me to You!” And on this note we were then asked to list our role models. It didn’t have to be someone famous or a Muslim, as long as the person had affected them in a positive way. In closing, Ustadh said that finding a spiritual guide to serve as a moral compass in today’s age was certainly difficult, though not impossible, and that as students we need to stop wanting whoever this guide may be to conform to what we imagine a guide to be. “Often, the teachers of the inward are hidden amongst the people and people don’t know who they are. We have created constructs of what it means to have a Shaykh which are sometimes unrealistic and fantastical, like a Harry Potter, Lord of the Rings kind,” Ustadh said, drawing laughter from the audience. May Allah continue to bless the da’wah of Ustadh Usama Canon. I think I speak for many who came when I say I cannot recall having sat through a more beneficial, enriching workshop in recent times. The writer blogs at www.hayatshah.com.